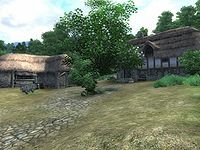 Cropsford is an under-construction farmhouse southeast of the Imperial City (quest-related). The village has the bad fortune of being located directly between the lairs of two warring goblin tribes, who pass through and fight on the way to the other tribe's lair. When you first discover the village it is largely a collection of timber and a few foundations. After completing the quest Goblin Trouble, the villagers make steady progress until all their buildings are complete. In addition to working on their buildings, they sow a crop of five corn plants by one house and two wheat stalks by the other. In the bedroom on the second floor of the Bincals' house you will find a "Reward Chest", which refills with money every week. This is the reward for completing the quest. In addition to the construction changes, you'll also notice that a few trees and bushes sprout up in and around the settlement. These begin to flower in the second stage of construction. Esta página foi modificada pela última vez à(s) 19h36min de 8 de setembro de 2014.